American oak barrel aged dessert mead made with black berry juice and white chocolate. UPDATED: APR 4, 2019 Flat purple pour, with an aroma that gets your attention. Sweet honey, blackberry jam and white cocoa are cut with a little tartness, making this more complex (even if ultimately just below) as good as the Strawberry. Sooo good! Bottle. Black body no head. Aroma blueberries fruits honey. Taste is fruits berries blueberries honey. Aftertaste is nice fruity sweet. UPDATED: FEB 25, 2019 Bottle pour at Bottlecraft. Crimson color, no head. Sweet taste with blackberry, honey, cherry, gooseberry, a bit of white chocolate and sugar. Sweet finish with blackberry, honey, cherry, white chocolate and berries. Excellent mead. UPDATED: FEB 23, 2019 500 ml bottle, batch 4, from Mikkeller webshop. Dark ruby body, with no head. Amazing aroma of juicy, sweet, dense dark berries, dark honey, moderate white chocolate, some nuts. Tastes also amazing and dense, pretty similar. Medium, oily mouthfeel, with no carbonation. Finishes smooth, sweet, dense, with lingering white chocolate, nuts, dark berries, dark honey. Amazing! So dense and rich, with the berries, white chocolate and honey so well dosed. Extremely comfortable to drink, with a perfect finish, the aromas staying forever. Another outstanding one by Superstition! UPDATED: FEB 1, 2019 Purple burgundy colour. Aroma is very vanilla, blackberry, sweet cherry, almonds maybe Italian sweet red wine. Taste is very rich of course with oodles of the same nuances as from the nose. Rich texture and lingering aftertaste. This is as good as any berry whites I’ve had. Supremely vanilled and cakey on the nose, super rich candied fruits on the palate. Great! Dark purple colour. Amazing aroma, vanilla, chocolate truffle, roses, concentrated berries, and a hint of mix spices. 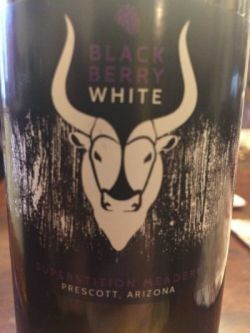 Sweet, luscious, the berry juice is upfront, followed by melting white chocolate, hint of spices, vanilla oak, with prominent acidity, and I even forgot about the alcohol. Rich, decadent. A Fruit Wine rather than a Mead. Perfect drink. UPDATED: DEC 14, 2018 Aroma of blackberry sweet juice, liquor notes. Taste is sweet and tart, fruity(blackberry and blueberry sweet juice).very complex flavours.. UPDATED: DEC 9, 2018 Bottle @ Mikkeller Aarhus. Deep red with no head. Aroma is honey, vanilla, oak, berries and rich. Flavour is honey, berries, vanilla, oak, sweet, rich, complex, little perfume, little citric and medium dry.